There is sinus bradycardia. 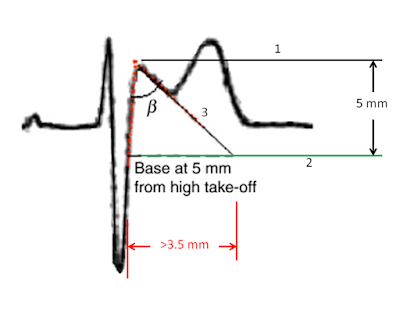 There is an rsr' in V1 and normal T-wave inversion. 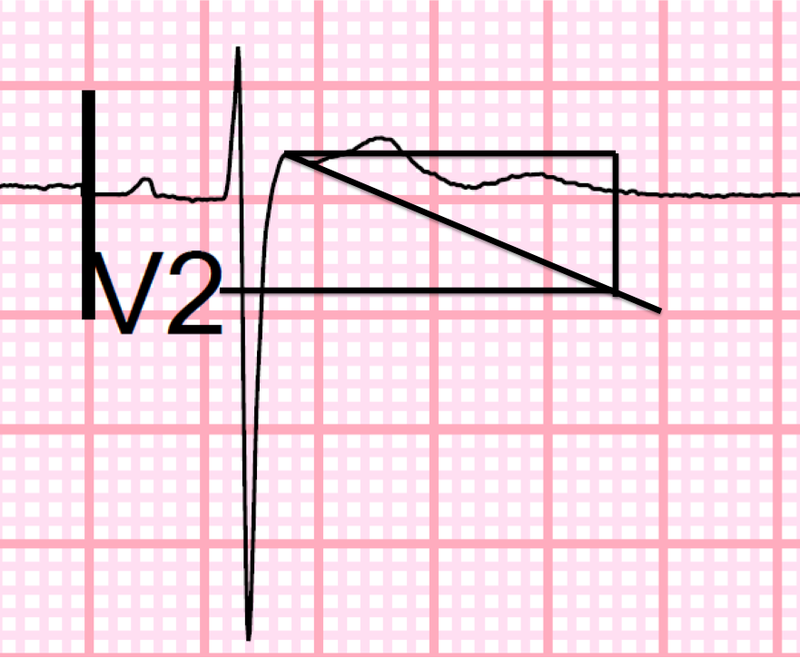 There is also a subtle Rsr' in V2, with some ST elevation and a bit of a saddleback. Are you worried about this ECG? There is no suggestion of ischemia. However, the r' in V1 is wider than normal. There is a saddleback in V2. These two features suggest type 2 Brugada pattern. This is NOT type 1 Brugada pattern (which is far more likely to actually represent Brugada syndrome) because the wide r'-wave returns to the baseline, then flattens out before having an inverted T-wave. Here is a more typical type 1 Brugada. The wide beta angle makes type 2 Brugada pattern much more likely. The bottom horizontal line is 15 mm and it need only be 3.5 mm. In this consensus paper, types 2 and 3 Brugada have been merged into one type called type 2. They specify the criteria to be used (below). a) An RSr' with a typical saddleback pattern in V1 and/or V2. This case meets this. b) V1 may have either an upright, flat, or inverted T-wave. It is upright here. 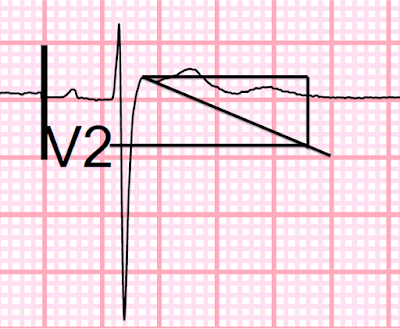 c) T-wave in V2 is usually but not always positive. It is positive here. d) Minimum ST segment ascent of 0.5 mm. There could be no saddle without an ascent. It is 1.5 mm here. 1. High take-off of the descending limb of the r' at least 2 mm above the isoelectric line (in our case, it is greater than 2 mm). The r'-wave is thus not distinct, as it is in benign causes of rSr'. It is exactly 2 mm here. 3. The base of the triangle outlined should be longer than 3.5 mm. This confirms that the slope of the ST segment is flat enough for the diagnosis. This is clearly the case here. Jani Tikkanen, who does a lot of research on early repolarization, says that "I personally do not like the term "J-point" when discussing J waves (or haissaguerre pattern etc), as people really get confused with terms and points. I'd still say that the J-point is when it hits the baseline, but J wave amplitude should be measured from the highest point, usually in the middle of the J-wave. This diagram by my EKG colleague and friend, Ken Grauer, shows the peak of the J-wave. The end of the J-wave is slightly farther right. So, as I interpret Jani's statement, the J-point would be at the end of the J-wave, which would be farther to the right than these lines are drawn. The peak of the r'-wave does indeed come slightly before the J-point. So, this ECG does seem to meet this criterion. So this ECG meets all criteria for type 2 Brugada pattern (morphology). 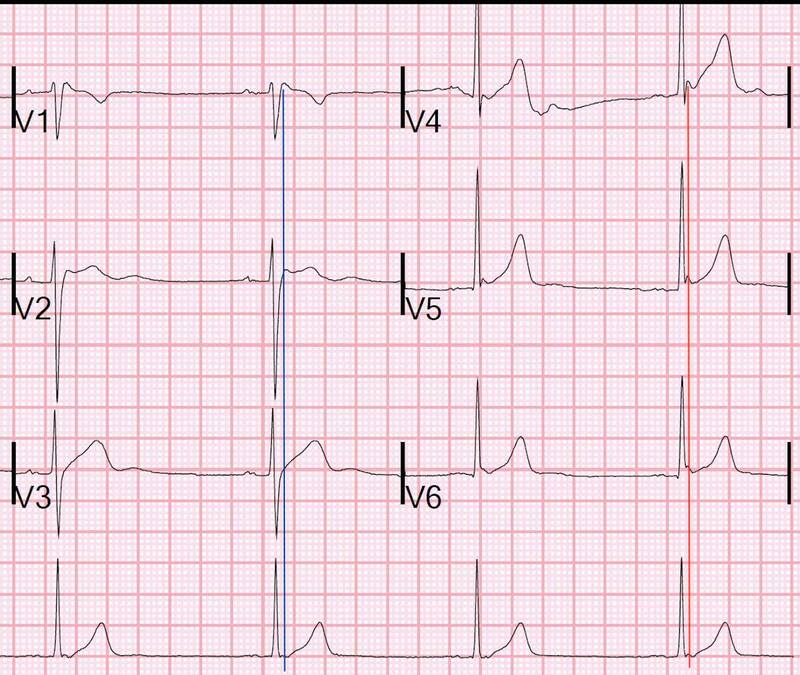 The clinicians were looking for ischemia and correctly interpreted the ECG as non-ischemic. He was discharged with treatment for asthma. But there was no comment on the possible Brugada morphology. At a later date he presented to another hospital with syncope. He was admitted and had multiple episodes of syncope, especially associated with emotion. None were recorded on cardiac monitor, but in at least some of the cases, he was found to be bradycardic down to the 30's afterward. Further history revealed that he father had sudden cardiac death at a young age, as did a younger sibling. He was also taking a prescription cough medication which can prolong the QTc and increase the risk of dysrhythmias related to Brugada syndrome. After a nondiagnostic EP study, a loop recorded was implanted for further diagnostic clarity. Cardiac MRI ruled out RV dysplasia. An echocardiogram was normal. As far as I can tell, he did later get an implanted cardioverter-defibrillator. Exactly what tipped the electrophysiologist over the edge to implant it is unclear, but must have been a recording from the implanted loop recorder. He presented again with syncope which sounded vasovagal, and his ICD was interrogated but did not reveal any dysrhythmia. 1. If you see an ECG that looks like type 2 Brugada, take a good history of syncope and ask about a family history of sudden death. 2. Refer the patient to an electrophysiologist if there is h/o syncope or family history of sudden death. 3. In my opinion, there is no need to admit unless the patient presents with syncope. I do not know if the fact of being a Spanish doctor contributes, but if I had attended to this patient, I had thought about Brugada, specially because of V1 and V2. Thank you very much for his work. In Spain we are very concern about Brugada. Interesting case. Do you know if there was some high V1-V2 lead recording for this patient? We teach (www.ecgu.ca) physicians to record (or ask for recording) a high V1-V2 ECG (3rd then 2nd intercostal space) to reveal a type I Brugada ECG pattern (which I believe would then be diagnostic). I think there was a case in our facility where high V1-V2 was positive and diagnostic. If not, we do refer those type II patients for procainamide testing (not to be done in the ED, our electrophysiologists team said this could lead to refractory VF). It's also funny that some years ago, we did learn much from... one of the three Brugada brothers, who were working in research and clinical at Montreal Heart. He did a lot of reinforcement, especially to the ECG techs, about how to do those high V1-V2. It would have been interesting to see the result of this case. Cheers. There was not high ECG recorded. 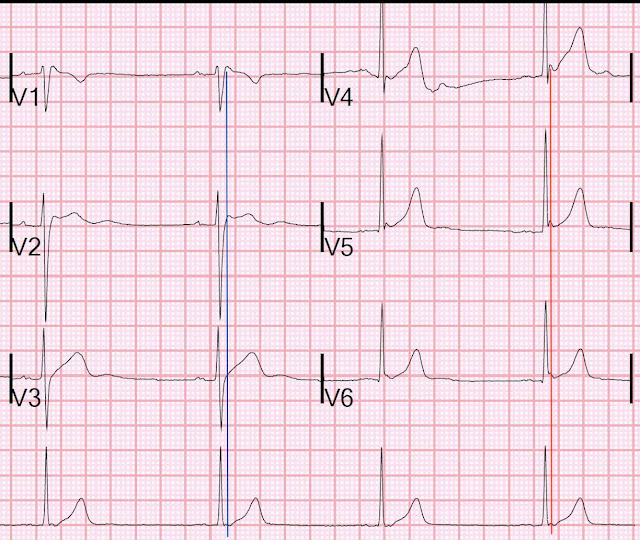 But this is a two-edged sword: normals can look like Brugada if you record too high (false positives). It may uncover Brugada, or it may give a false positive.